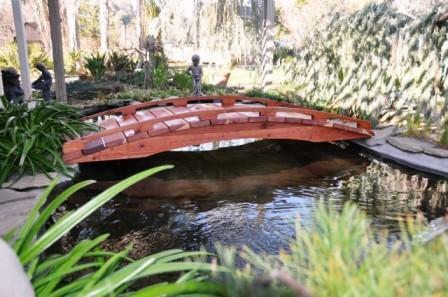 When you want a Japanese Garden Bridge to fit into your theme here is the perfect bridge just for your Japanese Garden. The use of garden bridges in Japanese style gardens is somewhat different to how they are conventionally used in the west. Whereas the main purpose of a garden bridge in the west is to allow one to cross over a narrow body of water, in a Japanese garden, the bridge may stretch over an actual stream. The Japanese garden bridge gives a feeling of transition within the landscape. So when you want a Japanese Garden Bridge to fit into your theme, here is the perfect bridge just for your Japanese Garden. With simplistic lines and low sides, allows for blend of tranquility between elements. Whether or not you have a stream or pond to traverse with a bridge, adding one to your landscape instantly creates a whimsical and dreamy milieu. Japanese garden has long been used as an inspiration for gardeners from around the world for its minimalistic design philosophies and focus on individual elements. Because the water element plays such an important role in the Japanese garden aesthetic, then, it is only natural that bridges would be included as natural enhancements to that element. The deck is 36" Wide and the total length is 96"
Other folks like the rich look & luster of a clear sealer that brings out the richness of the 100% redwood. If you go this route you may find a wood sealer to be useful by blocking the pores of the wood. This inhibits the grain from becoming raised yet allowing the natural fading to a gentle silvery-gray color We offer an optional factory sealing of 2 coats of Thompson's Water Sealwhich is a waterproofer plus a clear wood protector.